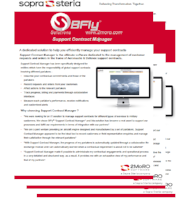 BFly® is a new way of thinking software solution for MRO and operation. BFly® back-end is the result of our combined experience between our other products and R&D programs, so it is our ''State of the art'' in terms of data model and functionalities. If you want to manage easily your suppliers and customers' contacts. Support Contract Manager is the perfect tool to monitor the KPIs and help to take the best decisions. BFly® CRM is a complete web solution to track the resolution of customer questions or remarks through a fully customizable workflow. Adminitrate the possible transition per object, status and role in the company, assign roles to users, check your to do list and access the formulars corresponding to the to te tasks affected to you. Ensure your on-field people & mobile assets' integrity. Track the position and virous parameters of a fleet of mobile equipment in real or remote time. Fleet Integrity Cockpit Service has been designed to track your mobile equipments and check their position and integrity. MyFleetRecords® is an innovative marketplace powered by BFly® and hosted by 2MoRO Solutions. When subscribe to MyFleetRecords®, a private data storage is assigned to you (Tenant). Any technical, operational or maintenance data you record will only be visible by you unless you authorize a tiers to access it. To exploit the data, an appstore proposes you to use not only 2MoRO turnkey solutions but any tierce application connected to the platform, including your own existing internal IT system.